You'd think a doily post would be on my craft blog Cross My Hooks, but I love when craft crosses with art & crosses with decor. These doilies are unique. They aren't your gramma's ordinary doilies. This great heart shaped plate is from Hideminy on etsy. I love the detail! This is a perfect bathroom/vanity accent. This great doily is actually porcelain! Can you believe it?? Check out Forest Clearing to pick up a few. 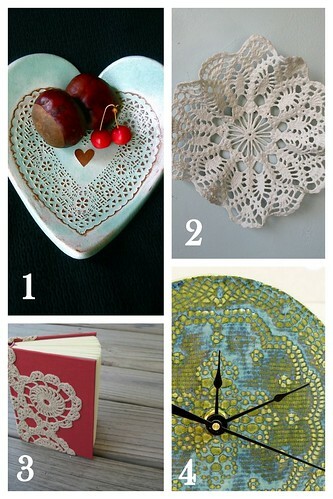 Make sure to read the shop info, you'll find out the secret to these adorable doilies! Finally, this clock would look great on any wall! I love the doily detail! Check out Lure Arts on etsy.